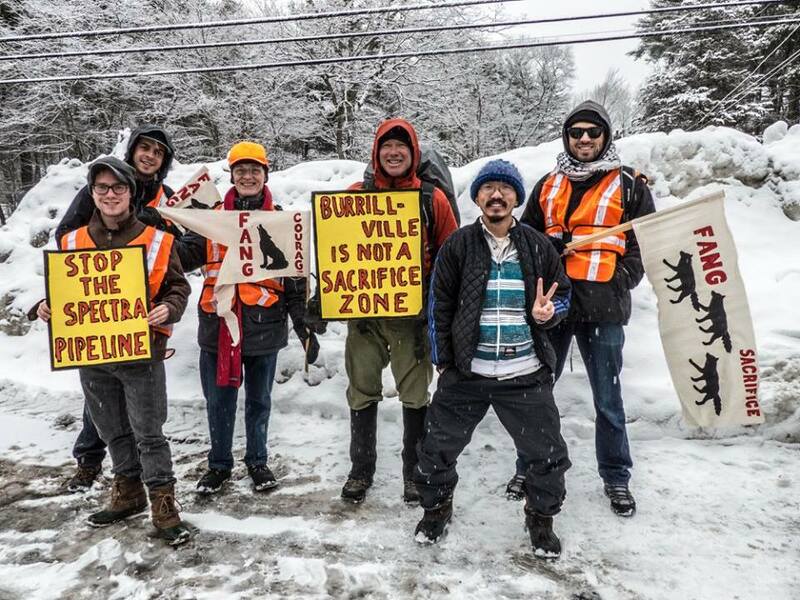 The March to Burrillville - FANG activists conducted a 28 mile march in the snow from the compressor station in Burrillville to the capitol building in Providence. The movement against Spektra Energy's fracked gas pipeline expansion gains momentum in New England. Spectra Energy currently operates a natural gas compressor station in Burrillville, Rhode Island that draws fracked gas from the Marcellus Shale through 1,127 miles of pipeline in New York, Connecticut, Rhode Island and Massachusetts. In anticipation of increasing global demand for natural gas, Spectra Energy have announced plans to build several hundred miles of additional pipeline, increase output, and make Burrillville a major hub of gas exportation on the East Coast. Environmental justice organization such as Fossil Free Rhode Island and FANG (Fighting Against Natural Gas) have rallied support across Rhode Island to protest expansion of the pipeline, which they have declared a "bridge to nowhere". Their efforts have resounded especially with residents of Burrillville, who are expressing growing fears over chemical exposure, noise pollution, and the risk of explosions. To date, 27 organizations from NY, CT, RI and MA have signed on to a letter to the Federal Energy Regulatory Commission (FERC), which has the power to approve the project. 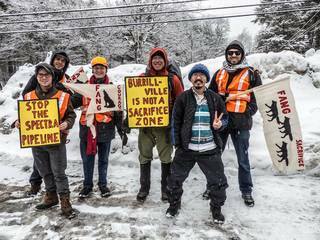 Most recently, FANG activists completed a 28 mile march from the compressor station in Burrillville to downtown Providence. Earlier in the year, four FANG members were arrested in the office of Sheldon Whitehouse, a Rhode Island Senator who positions himself as environmentally progressive, yet has actively supported construction of the pipeline. Development of Alternatives To date, 27 organizations from NY, CT, RI and MA have signed on to a letter to the Federal Energy Regulatory Commission (FERC), which has the power to approve the project. Why? Explain briefly. Expansion of the Algonquin pipeline was approved by the United States FERC (Federal Energy Regulatory Commission) on March 3rd, 2015. Spectra Energy plans to begin in April 2015. 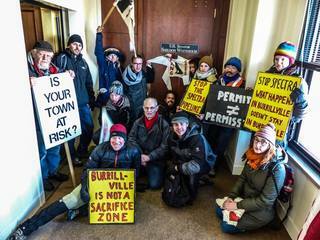 Waging Nonviolence: "Week of action marks turning point in campaign against Spectra Energy"
The Providence Journal: Burrillville residents, supporters on the march against pipeline plan. Video of a laugh riot action against Rhode Island "Bridge to Nowhere"
The March to Burrillville FANG activists conducted a 28 mile march in the snow from the compressor station in Burrillville to the capitol building in Providence. Contributor Eleanor Finley, University of Massachusetts, Amherst.